RIO DE JANEIRO, BRAZIL – With week fourteen of the American NFL (National Football League) finished, there are just three more weeks of regular season before the final three weeks of playoffs, leading up to the Superbowl on February 2nd. Watching the NFL in Rio is a shifting landscape, but there continues to be some great spots to get together with other fans and cheer on one’s team. 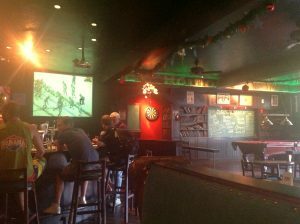 Shenanigan’s opens early and guarantees to show the NFL games when they are broadcast locally, photo by Jay Forte. 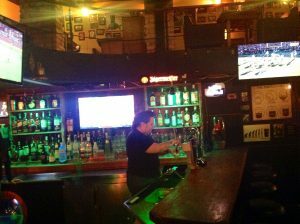 A long-running staple for watching the NFL in Rio is Shenanigan’s Irish Pub & Sports Bar in Ipanema. The bar was opened over ten years ago by a group of American expatriates, but last year was sold to Brazilian owners who fortunately continue to make showing the NFL games a priority. Opening on Sundays in time for the early games (which start at 4PM in Rio due to daylight savings time) with a large projector screen keeps Shenanigan’s the first option for many. To further tempt fans on game day, their menu offers American style nachos guaranteed to leave no one hungry, as well as chicken wings with enough heat to raise eyebrows (R$27 for ten). New to the list of options this year is the Clover Irish Pub located along Copacabana Beach. The bar was opened in October 2012 and then purchased earlier this year by a pair of Americans from Detroit who brought a new focus on showing sports, especially the NFL. Currently they can show more simultaneous games than anywhere else in Rio, and also just launched a midnight happy hour special, 2-for-1 Budweiser bottles (midnight until closing, Sunday through Thursday), to help keep those late Sunday and Monday night games lively. The Clover Irish Pub can play three different games simultaneously, photo by Jay Forte. For those looking for different vibe than an Irish pub to watch America’s Game, check out the Blue Agave, both at the original location in Ipanema and the more recent one in Copacabana. Both restaurants are owned by American expatriates, business partners Rich Nelson and Jason Galeria, who have made sure that the Mexican menu is on point with fresh salsa, California-style burritos and of course, lots of tequila to choose from. The Copacabana location has more seating and the ability to show different programming on their two separate screens, which is a life-saver during the seemingly endless Brazilian football (soccer) season. The Ipanema location is just off of the famous Posto 9 and makes for a great after-beach destination. Both locations are likely to stay open late for the night games. There are a few other locations that will show NFL games on occasion, such as Lord Jim’s Pub, Banana Jack’s and the Mud Bug. It is best to call ahead to make sure there are no conflicts with other sports programming, and plan to arrive early to lobby for the desired game.